Merthyr Tydfil Housing Association has unveiled a plaque to mark the official opening of 23 new homes in Aberfan. The £2.6m housing scheme at Railway Close was built by appointed developer ENGIE (formerly known as Keepmoat Regeneration), to rehouse existing tenants. Built to Level 3 of the Code for Sustainable Homes, the dwellings are energy efficient and provide excellent levels of comfort for the occupants. 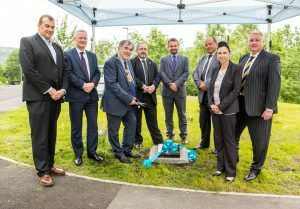 The scheme was funded by Social Housing Grant from the Welsh Government of £1.5m and private finance from Merthyr Tydfil Housing Association of £1.1m. As part of the work, ENGIE and Merthyr Tydfil Housing Association supported the local community by sponsoring events and providing construction themed workshops at local schools. The partnership also introduced an Induction to Construction employability programme which helped young people to secure paid employment, of which ,one young person was awarded the Traineeship Engagement Learner of the Year at the People Plus Awards. The development was completed in October 2017.